Recovering Relationships includes ENGAGING IN AN INNER DIALOGUE WITH THE CHILD WITHIN OURSELVES: This form of self-reflection allows us to ask ourselves a question in our own mind, and let ourselves freely associate to the answer. Our intuitive mind has the capacity to always give us just the answer we need at any given time1 – and to answer with the most beautiful truth – if only we ask and listen for the answer. Inner Child Within Dialoguing is a magical intuitive technique, because it is so simple and obvious: ask yourself a question and just listen for the answer! Why it can be so hard for so many of us, however, is that we live our lives so dishonestly that we are terrified to GET an answer. It might really rock our boat. But that can be no excuse for the truth-seeker engaging our child within. If our boat is faulty it needs to be rocked, and sometimes a good rocking shows right where the weaknesses are – which allows us to repair them. We actually use Child Within Dialoguing regularly as stage guides – in session with stagers – when we don’t know where or how to proceed. The part of our child within that answers our thorniest questions is a better stages guide than any we have ever had. We've been diplomatic for countless lives, always trying to avoid confrontation, never meeting our problems face to face. 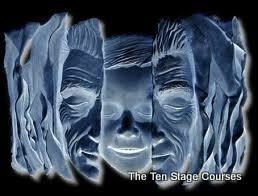 The Stages are re-born each day out of the intuitive answers uncovered during times of rest and recuperation.